Records crash as US freeze continues Jump to media player As cold and snowy weather continues to affect the US, part of Niagara Falls has frozen over. Time-lapse shows build up of US snow Jump to media player Time-lapse video shows the gradual build up of snow as residents in Poughkeepsie, New York are hit by a blizzard. Building freezes as fire tackled Jump to media player Freezing temperatures hamper firefighers in Philadelphia as water from their hoses and cold temperatures combine to create ice problems when tackling a fire. 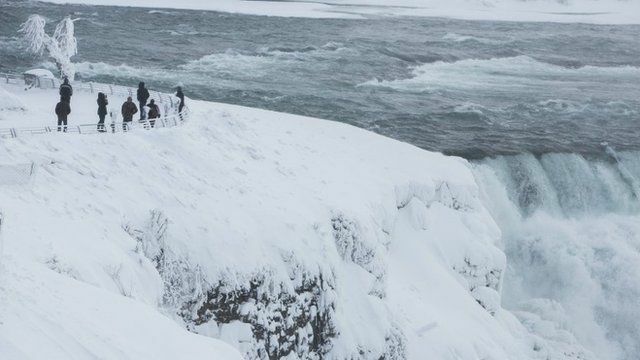 Climber scales frozen Niagara Falls Jump to media player Ice climber Will Gadd shocks visitors to Niagara Falls by climbing up a frozen section. US snowstorm warning in north-east Jump to media player The north-east coast of the USA has seen yet more heavy snow, causing flights to be cancelled and freezing temperatures. More snow woe for north-east US Jump to media player Piles of snow are dumped in waterways as parts of the north-east of the United States struggle to cope with heavy snowfall. Boston 'worn out' by more snow Jump to media player New England is hit by another round of snow with Boston expecting up to 2ft (60cm) of extra snow. As cold and snowy weather continues to affect the US, part of Niagara Falls has frozen over. In Washington, snow shovels were out at the White House, and cross-country skiers have been seen near Capitol Hill. And a giant snowball fight has also taken place in the US capital.